Process of work / Terms & conditions. 1. First visit will be to start the cleaning process. 2. Second visit will be arranged due to weather, it has to be dry for work to commence. 3. Jet washing, please make sure the work area is clear from any garden furniture or objects and a water access point is accessible, inform your neighbours if necessary as it can become messy and dirty, move vehicles well away from work area as dirt can splash up. Please make sure all windows, doors and garages are securely shut to prevent water seeping in, we do our best to prevent this but this cannot be helped in some cases. We will do our best to clean up all mess and dirt that is around and dispose free of charge. The paving will be good too walk on in about two to three hours depending on the temperature but the joints will take about 24 hours to fully cure so we always advise to leave vehicles off overnight. The next day will be perfect and ready for vehicles and pots ect. to be replaced. Work can still commence even if you are not around on the day we return, as long as we have your permission as we do not need anything from yourself. all windows and doors to be shut. 5. Resiblock is the worlds leading brand in paving sealers and has been established for over 20 years. The sealant we use is a solvent based material, which mean's the solvent will evaporate and may have a residual odour for a day at the most. We are registered with Resiblock. At sealing technique we give a one year warranty on our work, if our work is not up to standard or has gone wrong for any reason we will assess the work and put it right. We specialise in joint sealing and fixing and natural causes will always play a part in our work, Sealing stops the growth of weeds as long as the paving is correctly laid to British standard (bs 7533 p+3) it will be maintenance free. Moss is a fungi and will appear anywhere there is a dirt build up, although again sealing does help prevent this but we can't guarantee it. It is advisable that a very light clean every other year will prevent any dirt build up and keep your paving looking new and clean. could and can fail over time, even though Resiblock does offer stabilisation to your paving it cannot fight against causes. 4x4’s, trucks and even small vans can push brick work away from connecting brick work leaving gaps, exposed for dirt build up and regrowth of weed’s and moss. In the unlikely event that your appointment has the be delayed or cancelled by us, we will contact you as soon as possible. Will we not be held liable for any consequential losses resulting from any delay or cancellation. 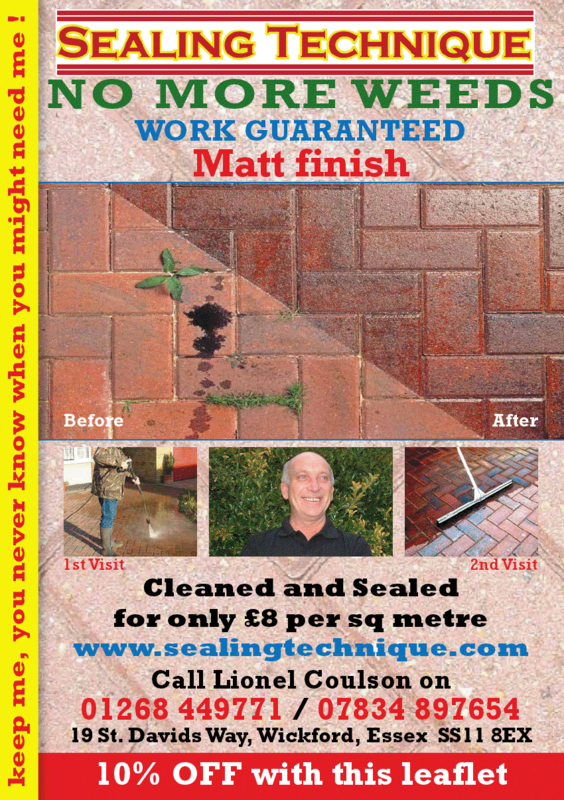 Liability disclaimer: Pressure washing can reveal pre-existing damage to the surface that are being cleaned. The company accepts no responsibility for pre-existing damage, which maybe revealed either during pressure washing or at any time after the pressure washing is complete. There is no up front payment needed or deposit, payment on completion of the job. We accept cheque cash or bacs.